I unboxed Dad’s old Lionel train Monday night. They don’t make them like that anymore. Dad’s train led a rough life. My investigative reporting skills tell me he got the train sometime between 1949 and 1952, and then sometime after 1953 he got a new locomotive and cars. And then sometime in the 1960s, the trains ended up in a box. I remember him telling me it came out a few times in the 1970s for Christmas, but most of my memories of Dad’s train are four big pieces of plywood with rusty track mounted on it, sitting in the garage next to a stack of repurposed liquor boxes containing train parts. Finally, when I was in the fourth or fifth grade, my incessant pestering paid off and the train found a new home in the basement. Dad and I plugged the track back together, and Dad wired the transformer. Then Dad produced two locomotives out of one of the boxes. Dad’s fanciest locomotive didn’t work at all. The smaller locomotive sputtered and sparked when he put it on the track. That was more than the fancy one did. Dad’s answer to everything mechanical was WD-40, so he went back up to the garage, got the can off the top of the gun safe (there was always a can of WD-40 on top of Dad’s gun safe), came back down, and blasted the locomotive with several spurts of the tinkerer’s favorite. (Incidentally, for those of you here seeking advice on trying to get an old Lionel train to run, this isn’t a good idea.) This time, when Dad put it on the track, the train produced a lot more sparks and a lot more noise, and it even moved a little bit. He picked it back up and blasted it again, with similar results. I asked Dad why the WD-40 helped. He said it would lubricate the moving parts, but it’s also a conductor of electricity. Dad eventually gave up and started paying more attention to the football game. I ran the train around the track a few times by hand. When I was in the fifth grade, this was more interesting to me than football. For that matter, it might still be more interesting to me than football. When I got bored with that, I decided to go over to the transformer and give the train some juice. The train hesitated, and it sure didn’t move fast, but it moved. I gave it some more juice, and it chugged its way around the track, gradually picking up more speed and creaking less. The more we ran it, the better it got. We started adding scenery. There wasn’t much of anything realistic about it, and Dad didn’t have much scenery short of a plastic diner and two train stations, but it was fun. Well, we moved a couple more years later, and the train found itself back in boxes again. Eventually it made its way out of the boxes and into the new basement. If I remember right, this was Dad’s doing, and not mine. The second time around, Dad spent more time with the train than I did. But after I went off to college and my parents finished the basement, the train went back into boxes. After Dad died, the trains stayed in boxes in Mom’s basement. After I bought a house, one weekend the trains showed up in my basement, where they stayed for about a year, until this week. What I found this week was a trio of dusty engines, three trailing tender cars, bits and pieces of scenery, one caboose, and a whole lot of rusty track. That was one more locomotive than I remembered and a lot fewer cars than I remembered. I suspect there’s still a box or two of train cars somewhere in Mom’s basement. One of the locomotives was very clearly missing a few pieces. I set it aside. I recognized one of the others as the plain-Jane locomotive Dad and I first messed with. The other one was fancier. I took eight straight pieces and eight curved pieces and made a circle. One of the straight pieces had the contact piece for the transformer, so I connected the transformer with two pieces of wire. I put the fancy locomotive on the track, fired up the transformer, and recalled the episode from 17 years earlier. I skipped the WD-40 this time. I didn’t have any, and the residue it leaves behind tends to attract dust, making the situation it was supposed to correct worse in the long run. I grabbed the other train. It was about as lively as I am first thing in the morning, but it made noise and it moved. I gave it a little push, and it moved even better. Eventually I searched the Internet, and I consulted with Tom and his mechanically inclined sidekick Tim, and they suggested I clean the track with some 600-grit sandpaper to remove the oxidation. After doing that, both locomotives ran pretty well. As for the engines, the first thing you want to do is use a soft brush to remove any dust you can find, both on the visible surfaces of the cars and locomotive but especially on the underside. The most common advice suggests a small, soft paintprush. I didn’t have one, so I ended up using an old soft-bristled toothbrush. That was fine, but you want to make sure it’s a soft-bristled one, such as an Oral-B. A paintbrush would definitely be gentler. The idea here is to get the dust off the equipment so it doesn’t find its way onto the track or, worse yet, inside the engine where it can gum up the gears and motor(s). Next, use a light grease to lubricate the gears and a light machine oil to lubricate the other moving parts. I didn’t have any grease, but I have a little tube of oil I use to keep my electric razor working well, so I applied some of that to a toothpick and lubed some of the moving parts on the two engines. Honestly, I don’t know how much of a difference the oil made. It seems to me that just running the engines, pushing them around the track with power applied until they were able to move on their own, made a bigger difference than anything else I did. If the only lubricant you have handy is WD-40, skip it. If you happen to have some compressed air, blasting some of that into the crevices after you’ve done a job with the brush probably will knock loose some more of the gunk that’s accumulated inside, but I wouldn’t bother unless the engine isn’t running well. It doesn’t seem to take much to get a vintage Lionel working again. There’s a train store on the way home from work that has a Lionel sign in the window. I stopped in on my way home tonight. I bought a very overpriced Lionel-branded maintenance kit–for $14.50 I got a little tube of oil, a little tube of grease, a bottle of some substance with the words “track cleaner” and “biodegradable” on the outside, and a pencil eraser. I bought it mostly for the directions on the back, and to hopefully help ensure that train store will be there a little bit longer. Perusing the store and perusing the awesome Postwar Lionel Trains Library, I found out, not to my great surprise, that few of the pieces I’d unboxed were particularly rare. The only rarity was Dad’s caboose. That did surprise me. It wasn’t popular, so it wasn’t made very long, so now it attracts interest. Figures. But that’s how it always goes with collectibles. The store had an elaborate Lionel layout in the front, with three trains and a level of detail I’m more used to seeing in HO- and N-gauge layouts. They used an aftermarket track with wooden ties and the middle rail painted black to make the notoriously unrealistic O-gauge track look much more like real track. The new locomotives had digitized sound effects and the whole layout operated by remote control. I have to admit, it was pretty impressive. But the cars and the engines looked cheaper and flimsier than Dad’s stuff made in the fifties. “For $130 I can add sound effects to your old engine,” he said when I looked less impressed than most people probably are. It sounded like a cool idea. But for now, I don’t think I want to mess with that. This set’s charm isn’t just about trains, and I’m not sure if jaw-dropping whiz-bang technology would enhance that charm or just cover it up. Sounds like a nice stay at home getaway to simpler times and fond memories. Hope you get to relax and visit often. Personally I think I’d go slow on the new technologies until maybe I had someone to build new memeories with. Thanks for a feel good article. This sounds like the Hudson my sister had. All of us in the neighborhood competed in their layouts. Of course, Dads helped. Yep, we found another box in the basement. We’ll bring it to you on Saturday. Is it true ubiquitous bloggers like yourself don’t care about comments? I thought so. I was blogged forward here, much to my enjoyment. Trains. Real good trains, taking over a garage on plywood complete in their own world. I’ve always wanted something like that if I ever became rich. Something about it…. I like your style. Nice to stop in and say hello. I think you’ve just awakened some old memories for me. Christmas and trains went together for years — now I need to get some together for my boys. I built a small HO scale setup in the early 80’s, with a knockdown table constructed of 1×4 lumber and 5/8″ plywood. It was nice to build something that would grow and get better over time. There was always room to add something else, and drilling through the plywood to add electric lights, switches, and other accessories was always fun. People would see everything light up, but couldn’t understand where the wires were, until you told them to look underneath, on the other side of the plywood. Painting things with toothpicks, Q-tips, and very small sponges was a wonderful way to spend time. A little fine sandpaper and 0000 steel wool took the gloss off new plastic pieces, and light dusting with grey or brown spray paint helped provide some age and detail. Model trains were always great fun for kids, grownups, and even older grownups, as well. Mark: Yes, I do care about comments, but don’t respond to everything. If I don’t have anything to add, there’s no point. If anything, I care about comments too much. Mark B: The reason for the association is pure marketing, dating back to the 1920s, as I found out when I researched Lionel a bit. But it makes sense. A lot of people don’t have room for a train to be up all the time, so you get it out during a special time of the year, particularly a time when lots of people will be visiting who might also enjoy it… So I guess the marketing turned into a tradition that makes sense. Keith: Dead on. For me, a lot of the fun is designing and building the stuff. The train’s fun, but there’s a lot more to it. You’re building a world. Being able to build a representation of a world that isn’t there anymore is tantalizing. Fixed. I have anti-hotlinking in place on the servers; you’re place is now on the ‘allowed’ list. A bit of history: that set showed up under the Christmas tree in the mid-fifties. It later became part of my father’s massive O27 layout in his garage. A few years before he died, the set showed up again at Christmas, this time in a custom built box he’d made to hold it. …and yep, it all still works fine. Thinking back to one of your earlier postings. I wonder, is this more fun than Railroad Tycoon 3? 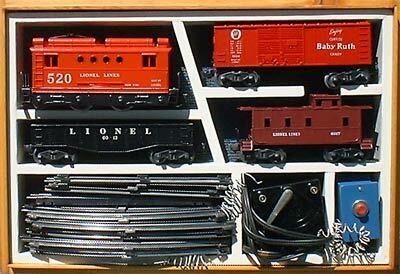 I have an old Lionel train in my garage in a box. It was a set that Dad bought me for Christmas many, many years ago. Somehow, when my stepmom sold off everything else after Dad died, I wound up with the box. One of these days, when things settle down, I’m going to get that box out and clean everything up and see if I can get it working again. It will be fun to tinker with it again. I’d say that Model railroad is more fun than any computer game no matter how great a game it is. Model railroading is hands on fun. Everything is in your control from how bad to how good your scenery looks. I’m on my second third layout that a friend and I are building. We don’t get to work on it very often, but there is nothing like the satisfaction of completing a new section of scenery or laying of some track.